Permission is granted to reprint this page. When preparing specifications for a new Compressed Air Foam equipped apparatus, use the following technical specifications to assure that your apparatus will be equipped with the most advanced CAFS system available; Darley AutoCAFS II. The pump shall be a Darley LDMBC single stage fire pump, capable of a water flow rating from 1000 to 1500 GPM. Power to drive the pump shall be provided by the same engine used to propel the apparatus. The pump shall be midship mounted and designed to operate through an integral transmission, including a means for power selectivity to the driving axle or to the fire pump. The pump casing shall be a fine grain cast iron alloy, vertically split, with a minimum 30,000 PSI tensile strength and bronze fitted. The pump shall contain a cored heating jacket feature that, if selected, can be connected into the vehicle antifreeze system to protect the pump from freezing in cold climates. The impeller shall be a high strength bronze alloy of mixed flow design, accurately balanced and splined to the pump shaft for precision fit and durability. The impeller shall feature a double suction inlet design with opposed volute cutwaters to minimize radial thrust. The seal rings shall be renewable, double labyrinth, wrap around bronze type. The pump shaft shall be precision ground stainless steel with long wearing titanium hard coating under the packing glands. The shaft shall be splined to receive broached impeller hubs, for greater resistance to wear, torsional vibration, and torque imposed by engine. A stuffing box shall be provided and shall be of the plunger injection style, utilizing a plastallic composite packing equalizing pressure around the shaft. Packing shall be renewed by removing the plunger, inserting the packing, and reinstalling the plunger. This packing design shall be provided to minimize friction, heat generation, and apparatus down time. This feature is designed to allow replacement and/or adjustment of packing within a 15-minute time period. Due to the advantages of the above packing feature, rope or braid type packing gland designs are not acceptable. The bearings provided shall be heavy duty, deep groove, radial type ball bearings. They shall be oversized for extended life. The bearings shall be protected at all openings from road dirt and water splash with oil seals and water slingers. The transmission case shall be heavy-duty cast iron alloy with adequate oil reserve capacity for low operating temperatures. The transmission case shall contain a magnetic drain plug for draining the gear case oil and a dipstick for checking and filling the level of the gear case through its opening. The transmission shall also allow the use of an external heat exchanger for increased cooling under extreme conditions. The pump driveshaft shall be precision ground, heat-treated alloy steel, with a minimum 2-1/2" x 10" splined ends. Gears shall be helical design, and shall be precision cut for quiet operation and extended life. The gears shall be cut from high strength alloy steel, carburized, heat-treated and ground. The gear face shall be 2 3/8" minimum. The gearshift shall be a heat-treated alloy steel splined spur gear to engage either the pump drive gear or the truck drive shaft gear. The pump and apparatus manufacturer’s Engineering Department shall select the gear ratio of the pump. Due to the advantages of the above gear and drive feature, chain drive and designs requiring additional lubrication are not acceptable. A discharge manifold, as supplied as part of the pump by the pump manufacturer, shall include a discharge check valve assembly to allow priming of the pump from draft with discharges open and caps off. No exception. Due to the importance of the above discharge manifold and check valve assembly, intended to be included with the overall pump design, there shall be no exception allowed to this requirement. Discharge outlets shall have extensions with companion flange openings to allow ease of service. Two ports shall be provided on a pump panel for testing of vacuum and pressure readings. A hand speed counter outlet shall be supplied on a pump panel for measuring engine RPM ratio. A weather resistant Performance Data Plate shall be installed on a pump panel. The pump priming system, heat exchanger system, discharge and suction valves, relief valves, pump shift, and master drain shall be as detailed elsewhere in these specifications. Two (2) manuals covering the fire pump, pump transmission and selected options of the fire pump shall be provided with the apparatus. The pump transmission shall be designed to accommodate an integrated, air compressor mounting bracket. This bracket shall be installed to properly align a rotary screw air compressor with an external sprocket driven by the pump transmission. 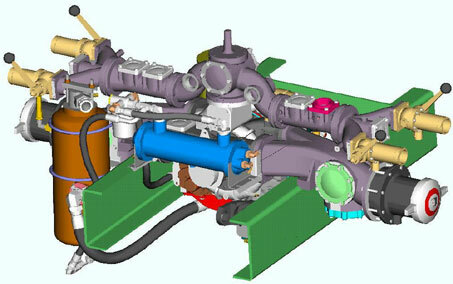 The air compressor shall be driven using a Gates “Poly Chain GT" belt drive system. The air compressor drive sprocket shall be supplied with an electric over air, multi plate, industrial clutch providing engagement at idle and disengagement at any rpm. The clutch shall incorporate an automatic, high CAFS oil temperature shut down to avoid damage to the rotary screw air compressor. An interlock shall be installed to prohibit air compressor engagement if engine rpm is higher than recommended. Description: This fire apparatus shall be equipped with a high-energy, automatic compressed air foam system (AutoCAFS). Ratings: The fire pump and air compressor shall be sized to provide at least 220 CFM (cubic feet per minute) of compressed air while simultaneously flowing at least 440 GPM (gallons per minute) of water flow. The pressure of the system shall be set at 125 PSI for the duration of this test as outlined in the NFPA document 1906. This rating is consistent with the NFPA recommendation that the water pump shall discharge two gallons of water for every one CFM of compressed air discharge. Fire pumps with UL ratings in excess of 1000 GPM commonly flow near capacity while simultaneously operating the air compressor at full output. Components: The air compressor shall be a high quality, industrial rated, modulating, continuous duty, and of rotary screw design. The air compressor shall be mechanically driven by the main pump and shall be so designed as to provide optimum performance at 70% of rated engine RPM. Air compressor drive train shall provide a means to engage and disengage the air compressor as required. The air compressor system shall include a pressurized oil lubrication system, oil reservoir with receiver/separator element, oil filter, inlet air filter, and modulating air inlet control. The air compressor shall be provided with a pressure control system to automatically balance air pressure to water pressure. The air compressor inlet valve shall open and close to provide the airflow desired while maintaining the air system pressure to water pump pressure to within 5 PSI differential. This balancing system is essential for safe operation of a compressed air foam system. The air compressor lubrication system shall require cooling water to be supplied from the fire pump through a shell and tube type heat exchanger to cool the air compressor oil. The water flow to this oil cooler shall be supplied using a flushed strainer system to ensure a consistent flow of cooling water. The oil temperature shall be thermostatically controlled to remain at a consistent operating temperature within a range from 170° F to 180° F.
Panel Mounted Controls: The air compressor system shall have mounted on the operators control panel an air compressor engagement light, CAFS oil temperature gauge, and a high oil temperature warning light/buzzer. Flow and pressure gauges shall be provided to monitor CAFS system total air and water discharge conditions. Gauges and controls shall be positioned and clearly marked so as to provide simple and easy operation. Each of the components of this Automatic Compressed Air Foam System - (air compressor, drive system, foam proportioner, control and instrumentation system) shall be sized, driven, and installed to produce a well operating and reliable CAFS unit. The compressed air foam system (AutoCAFS) shall be completely installed and tested by the fire pump manufacturing facility before delivery. No exceptions.